I hope everyone had a wonderful Christmas. We had a very nice, laid back day around here. It was just my husband, son and me. Then yesterday, we went to Pampa to spend the day after Christmas with my parents. We had a wonderful day with them. We waited til the day after because the fabric store there is having a going out of business sale, and it was open on Friday. I am sad it is closing. Mom & I really enjoyed our little outings there together. So of course, we had to have one last hoorah there 🙂 There will be more about that in my Sunday stash report…hehehehe. Today was a great day, as well. I finished up the quilting on my customer quilt, and I am pleased with it. I hope she will be. I sure had fun working on it. After I finished this, I felt like just doing some piecing. Piecing for the sheer fun of watching the pretty blocks come together. Remember these fabrics I purchased earlier this year? I couldn’t stand just looking at it any longer. I had to start cutting it up and sewing it back together. These blocks are FUN to sew together. I also washed some white fabric and some 30’s repros that I want to use in another quilt. And I’ve done some sewing on the leaders/enders scrap quilt I’m making for my Mom. I’ll put pics of that in tomorrow’s post. I am truly grateful for days like this. They are like a little gift. I hope you are enjoying your weekend and doing something you love! 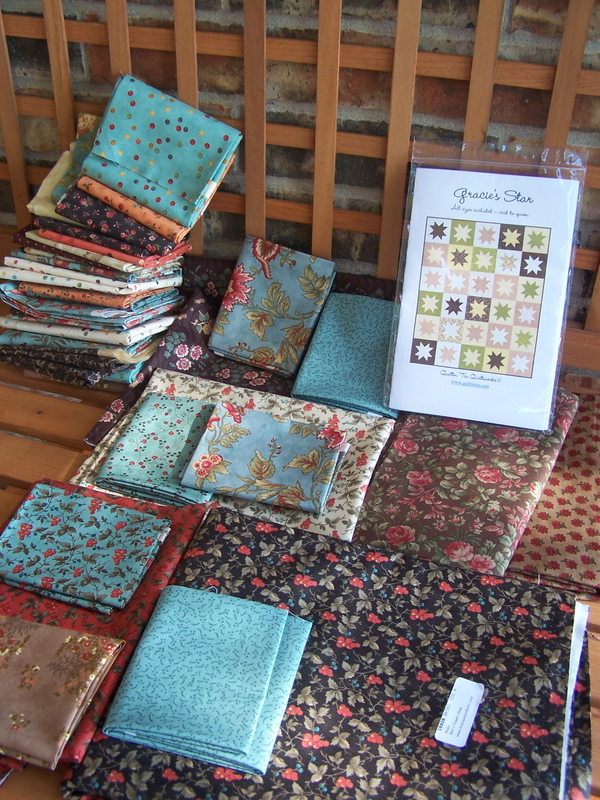 Randi, your quilting is just perfect for that quilt – it’s beautiful! Love your blocks too. That’s going to be a very pretty quilt. I’m jealous of your sewing time. I turned my aching back into a pulled muscle yeterday so I’ll be sewing via the web for a few days! Guess I’ll get caught up on some of my quilting DVDs! The quilting looks great! I’m sure your customer will love it! I love the quilt in progress too!!! Randi that quilt is just gorgeous! You did a beautiful job on it…I’m sure your client will love it. The piecing looks great too…beautiful colors. It is wonderful to have time to do your own thing…I too am enjoying that this week….a rare treat! Randi, That quilting is perfect! Gorgeous, gorgeous! You’ve outdone yourself for sure. Randi, I always love your quilting and this quilt is another one that shines with your touch. Love the green and how it’s works with the other shades. Randi, the quilt is just beautiful. Your work is really amazing. I love your quilting on that quilt. 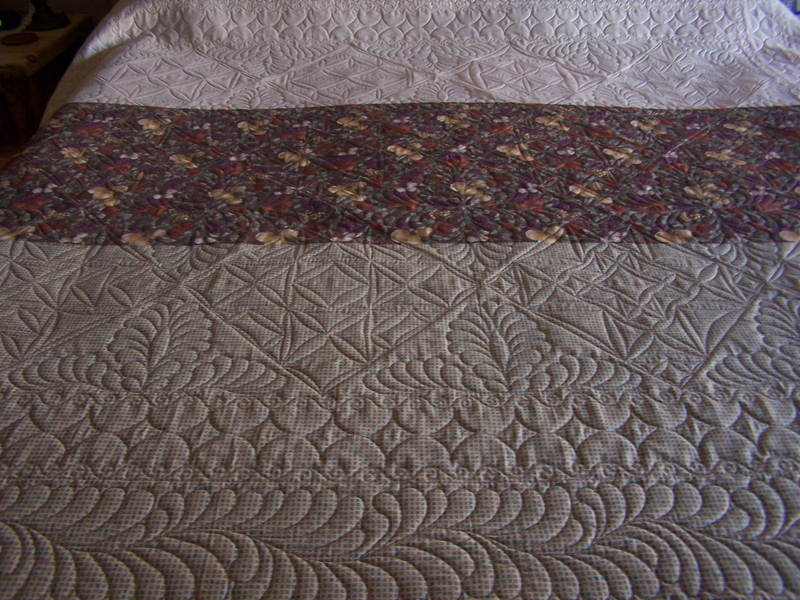 Thank you for sharing your good choices of quilting and gorgeous finish! Very inspiring! Your quilting is stunning Randi. The quilt is gorgeous. I love your new quilt you are making. Wonderful, Randi! I like everything you did here! The quilting is perfect for this top!! 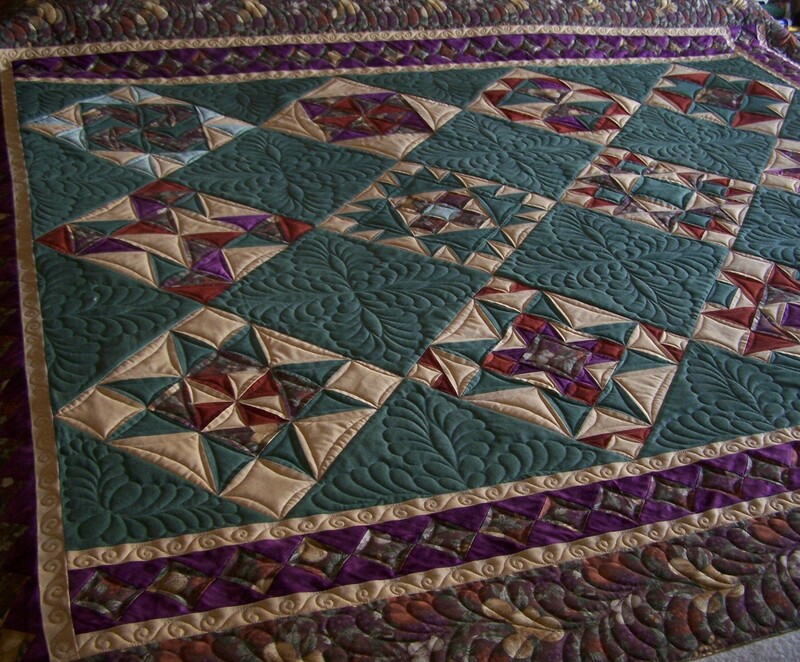 Wow – beautiful quilting…what a transformation! That is gorgeous quilting. The back is as pretty as the front. You did a fantastic job! Beautiful quilt! 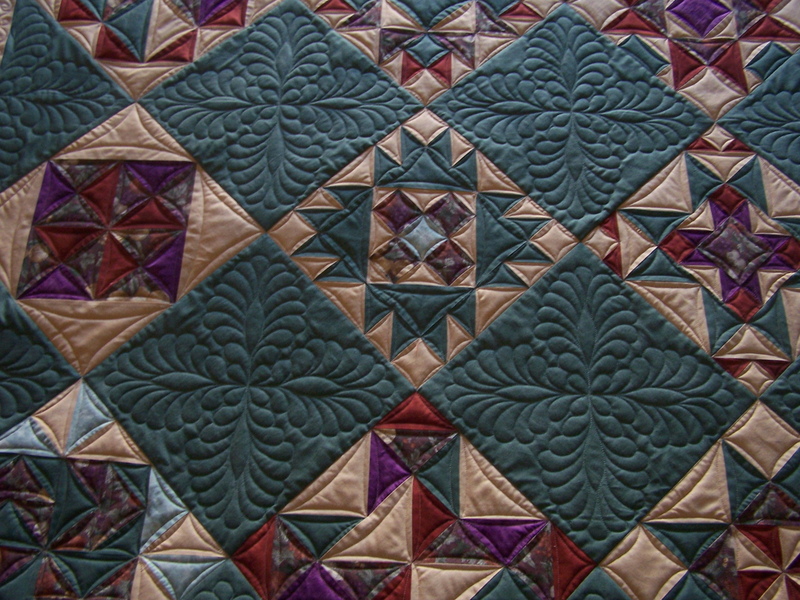 The quilting in the plain blocks is a wonderful eye-catcher. Everything about this quilt is gorgeous, and the colors are magnificent! Randi, your quilting on this one is just perfect! You do beautiful work. Your quilting is gorgeous, I’m sure your customer will love it. 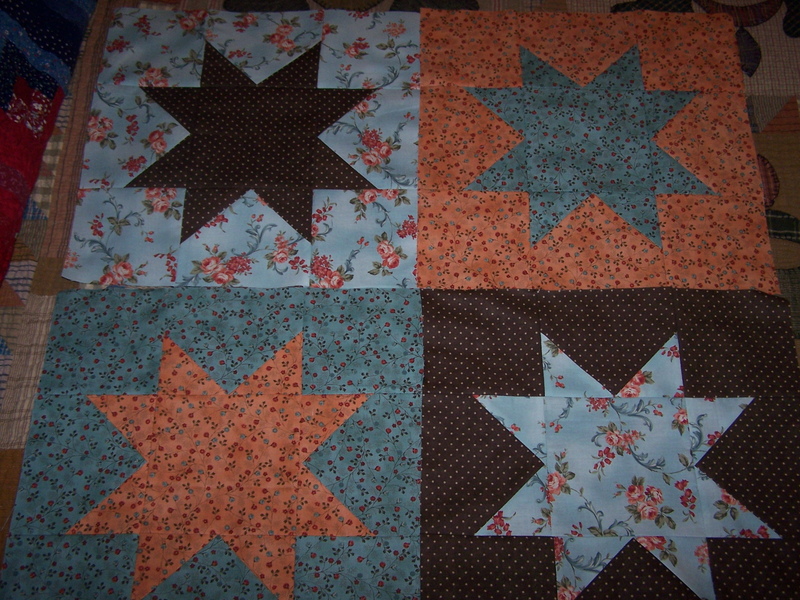 I’ve had a sawtooth star quilt on my to do list for a long time, maybe this is the year it will get made. These blocks look great with your fabric choices.